Once thought of as Sony's unofficial mascot for the PlayStation, Crash Bandicoot is some kind of marsupial many of you will never have even heard of. You might also be forgiven for not having heard of him if you've only started gaming in the current era of gaming. He hasn't had much of a presence, but Activision is looking to rectify that with a HD remaster of the original PSOne classics, rebuilt from the ground up for the current generation. The games are very much tried and true platformers, and how you progress will very much depend on how you handle those core platforming mechanics. As bandicoots aren't very clever, the developers decided that this bandicoot was going to be no exception. He can run and jump... that's it. The simplicity of the character capabilities reflects on the structure of the level design. These are platformers, pure and simple. In terms of gameplay, Crash Bandicoot has a "just one more go" feel about it. This game appears deceptively easy at first, but environments soon become a harsh challenge, as deadly platforms, long jumps and moving obstacles attempt to bring you the "Game Over" screen. While the Trilogy does have that tough, old-school platforming vibe, however, the developers have made concessions to less harsh modern difficulty curves. The game detects how well you're doing and, if needs be, will give you a helping hand with the Aku Aku mask, which will make you less susceptible to harm. 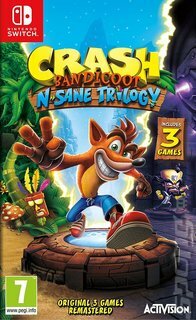 It's easy to see why Crash Bandicoot has become such a popular character with gamers: the sheer imagination which has put this game on the shelf deserves top-billing, along with a memorable supporting cast of baddies, and of course, the titular hero's almost maniacal, determined grin, stays intact throughout.